The Church of Saint Symeon the Stylite in Aleppo, Syria was taken by Islamist forces in 2013 to serve as a logistics and training base. It made an arresting backdrop for the well-developed media skills of the Islamist forces, who posed groups of black-veiled women engaged in weapons drills in front of the great southern entrance, with its commanding central arch and its richly decorated capitals swathed with wind-swept acanthus leaves. 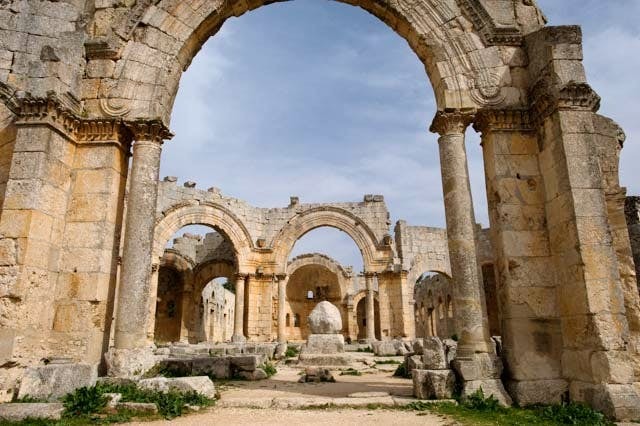 The Islamist forces were perhaps confident that the church complex (which included a four-sided monastic establishment wedged between the eastern and southern basilicas) would be off-limits to Syrian official reprisals. It is one of the major Syrian archaeological sites, and was included on the UNESCO World Heritage list in June 2011 as the highlight of the ancient villages of Northern Syria group of ruins. Reports have been coming in for over two years of minor damage from firearm impacts on the structure, stone removal, and illegal digging – all sadly common occurrences in the numerous ancient villages in the area. 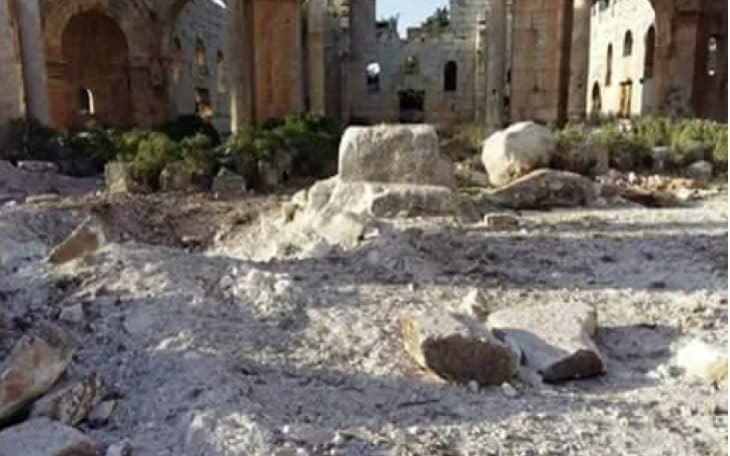 Opposition elements signaled a new and more deliberate assault on the church and its attached monastery on 12 May 2016. The remains of Saint Symeon’s column in the central courtyard took the full force of an explosive impact near its supporting base. The blast was so great that the column remains were hurled into the courtyard. One of the columns flanking the south entrance portal was shattered and much of the arch above displaced. Amr al-Azm, a Syrian-American academic who is trying to organize the preservation of Syria’s endangered heritage, said three sources in the area including researchers who were monitoring its condition told him they believed Russian jets were responsible for the attack on Thursday. He called the damage to the site “devastating” in a preliminary report. The facade of the church was holed, while part of the original pillar on which Saint Symeon lived, preserved on a pedestal in front of the church, was knocked to the ground. “You can see the damage to it,” Mr Azm said. 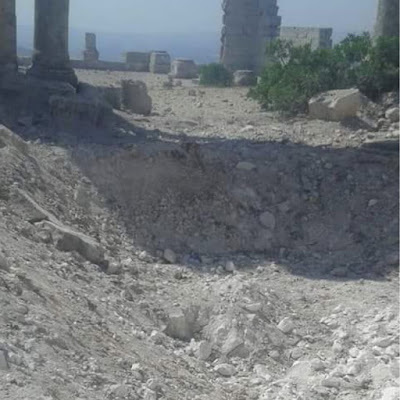 Photographs showed a large crater in the nave where the missile struck.